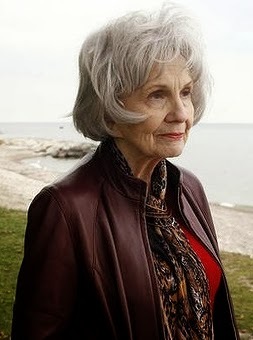 Alice Munro became the first writer whose reputation derives almost exclusively from short stories—and the first Canadian—to win the Nobel Prize in literature. It is true that other Nobel winners have written many distinguished short stories, perhaps most conspicuously Isaac Bashevis Singer. But it is also true that Singer wrote nineteen novels, and in awarding him the Prize in 1978, the Nobel committee cited his “impassioned narrative art which, with roots in a Polish-Jewish cultural tradition, brings universal human conditions to life.” The other great story writers who took home the Prize—Heinrich Böll, Sh. Y. Agnon, Ernest Hemingway—were also prolific novelists who conceived of themselves as novelists. Alice Munro is the first Nobel winner whose entire career has been devoted to the story. To overlook this fact about her, to consign her to being the thirteenth of her gender rather than the first of her genre, is to overlook her importance in literary history. It is, in fact, to dishonor her. When she was a young writer, just starting out, Munro hoped (like any fiction writer who hopes for greatness) to write novels. In her modesty, she later claimed that her labors as a wife and mother kept her too busy for anything longer than stories. “A child’s illness, relatives coming to stay, a pileup of unavoidable household jobs, can swallow a work-in-progress as surely as a power failure used to destroy a piece of work in the computer,” she said. “You’re better to stick with something you can keep in mind and hope to do in a few weeks, or a couple of months at most.” As I wrote in my Commentary essay on her last year, though, this modest explanation should also be understood as a sly apologia for the short story, perhaps the ideal form of literature for the busyness of career-driven postmodern lives. Few have ever been better at the form, and in awarding Alice Munro the literature Prize, the Nobel Committee is also (at last) recognizing the short story’s essential place in modern writing. * When I was a newspaper reporter, the recycling of press-release language in a story’s lead would have been cause for a severe dressing down. But perhaps journalistic standards are different now at the Times. I read your post while listening to the radio station France Info, and you'll be glad to hear that in their summary of headlines (before even getting to a story on the Nobel), they share your priorities, calling Munro "la reine de la nouvelle." I was listening to Canadian radio when the announcement came, and it interviewed Ms. Munro. Thankfully, she made no mention of gender (or race, class, country of origin, political or religious affiliation, and etc.) but only of her art form and that she hoped that the prize would help raise the short story in stature. Having grown up (and grown well into middle-age)reading and teaching short fiction I'm always surprised that there is this sense of forlornness attending the endeavor, but it must be there. The Times was simply stating the most obvious fact - the Nobel, like all prizes, is as much about politics as it is about literary achievement. Not to diminish Alice Munro's accomplishment as a writer, it is perhaps more significant that she is a woman and a Canadian, just as it was significant that Singer wrote in Yiddish. The Nobel committee undertands the politics of their decisions when they decided to shine the spotlight on Munro, just as they did in recent years for Herte Muller, Doris Lessing and Elfriede Jelinek. But the Prize is one thing and Munro is another. The Prize might have been an occasion, whatever the motives behind it, for turning attention to Munro. And she deserves to be known for what she writes, not for where she stands in line! Ah, but despite a well considered analysis, you got it wrong in 2009 (not that I, or anyone, could have done better). Of course the prize is one thing and Munro another. But the prize is a BIG thing, which is why we bother talking about it. To my mind, it's more significant that Munro is a woman and Canadian (since I'm also a Canadian writer) than the fact that she wrote exclusively short fiction, ust as it was more significant that Bellow and Singer were Jewish. I loaded up my audio reader before I left the US for a 2 month trip to Europe. What did I include? Alice Munro's latest collection of short stories, Dear Life, which she has said is her last collection. I am hoping this well-deserved award will encourage her to write on. As Professor Myers points out in his Munro essay, A Fitting Finale, (linked to in this post and which everyone should read), "Her affirmation of human life is deeply ambivalent....Her characters stand at the edge of a distant world, trying to decide whether to take a step and enter it. They are snared between responsibility and freedom, and though they invariably choose freedom, they don’t find a meaning for their lives—they ‘just go on to a different life,’ as Munro observed in an interview. She doesn’t moralize at all, but the reader can’t help being disappointed at her characters’ choices." Munro doesn't make the mistake that many of us do, believing that we're fully grown just because we're living in adult bodies. She knows that we're just big kids exhibiting varying levels of maturity. Her narrators are some of the most mature adolescents around, struggling terribly with ambivalence and making big choices with massive consequences marking the differences between having freedom and taking responsibility. Munro gives ambivalence a good name, endowing and crediting it with the prominence it deserves by making our personalities wrought with dissociation. She deserves the Nobel, not because she's a woman, or Canadian, but because she's the preeminent short storyteller of our postmodern age. Munro’s narrators tell her short stories from varying perspectives of life’s long view. This allows Munro’s readers to experience them as a veiled dance. What Chekov reflected of modernity in his portrayal of emotional honesty, Munro mirrors of postmodernity in which we get what we deserve.